For all of the many great restaurants in Vancouver, there are only a few that I would use my valuable time for a return visit (or visits). 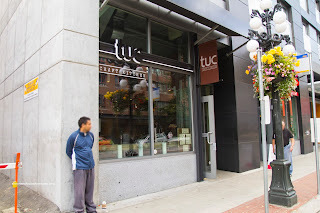 One of which is Tuc Craft Kitchen on the edge of Gastown. This little spot gets pretty favourable reviews and has many loyal customers. The reason why? It's actually really simple - they produce delicious food. Yes, it is true. 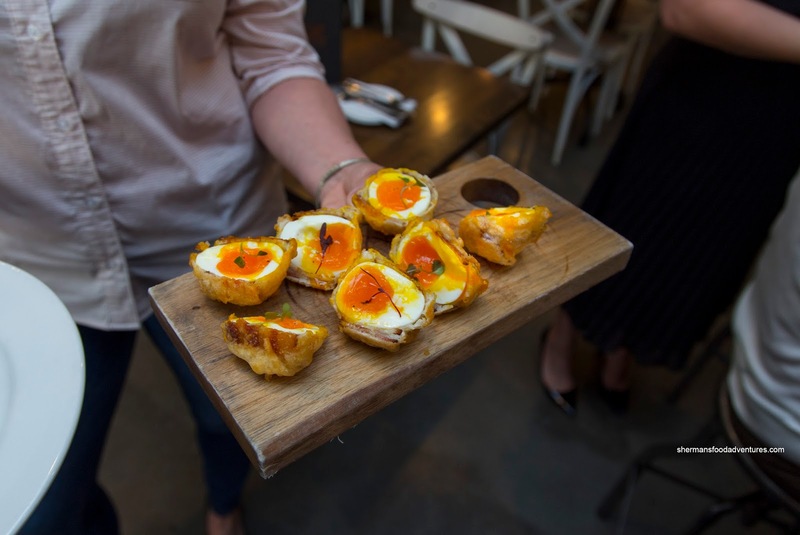 There are plenty of restaurants in town that focus far too much on style and social media hype and do not put enough effort into their menu. 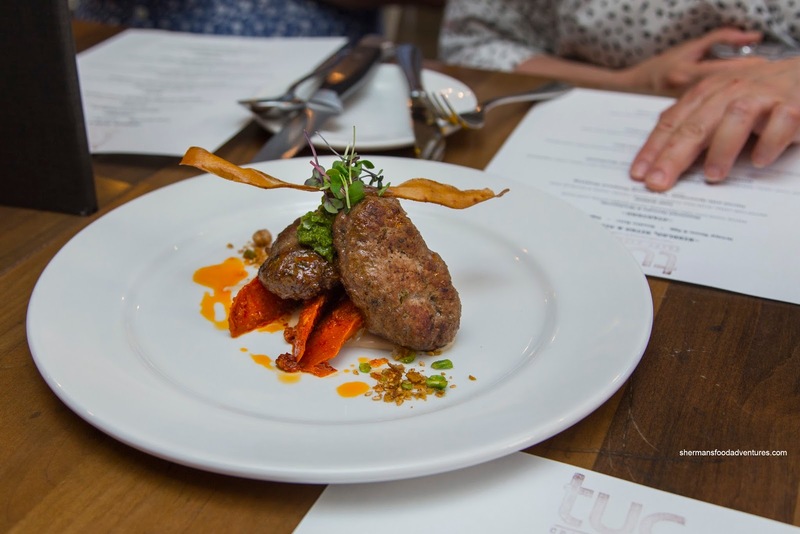 At Tuc, their ever-changing offerings speak for themselves without the need of stupid gimmicks. 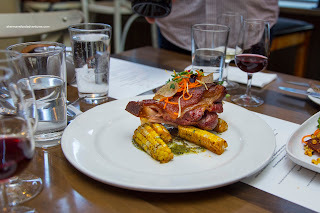 I was recently invited to their Summer menu launch and there was no need to ask twice! 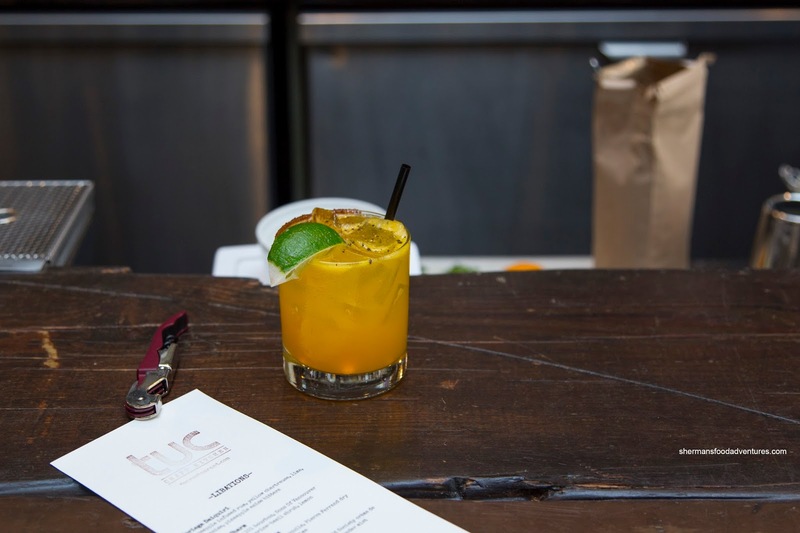 To start things off, I tried their Turmeric Margherita with Hornitos reprosada tequila, Pierre Ferrand dry curacao, orange juice, turmeric and lime. Loved the colour and bright flavours which was perfect for a warm day. It was refreshing with just a hint of bitterness from the turmeric and plenty of zing from the citrus. This was a dangerous beverage as I could've downed many of these easily. Our first small bite was the Vegan Rarebit based on the traditional Welsh dish. 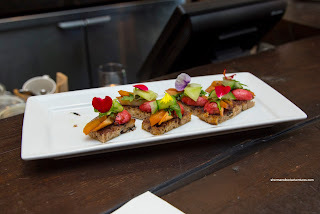 This one sported rye bread topped with roasted veggies, caramelized onions and smoked onion sauce on top. Despite the amount of wet ingredients, the bread was crunchy and stayed firm. I found the roasted veggies fully cooked, but still retained a bite. The sauce on top was slightly sweet with a touch of acidity. The best starter by far was their popular Crispy Bacon & Egg which is an interpretation of a Scotch egg (being relatively lighter without the use of sausage). As evidenced in the picture, the egg was as perfect as one would hope for being a beautiful free-range orange and runny. Of course some preparations would have it fully cooked, but c'mon, this was sexier and not rubbery. On the outside, the bacon was meaty and lightly crispy as with the thin layer of tempura batter. 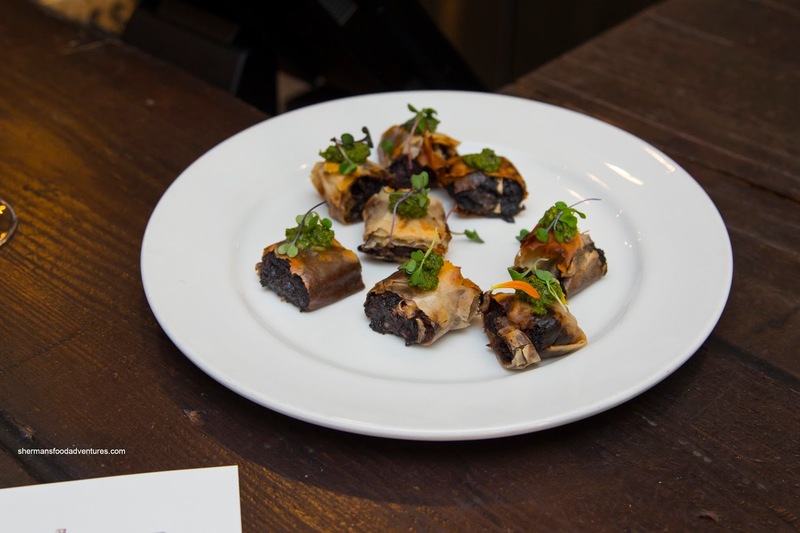 Another English-inspired little bite was the Boudin Noir featuring blood sausage wrapped in crispy pastry. I found the flaky pastry to be very buttery while the boudin was soft and not especially heavy. I found it rather airy with some richness and aromaticness. 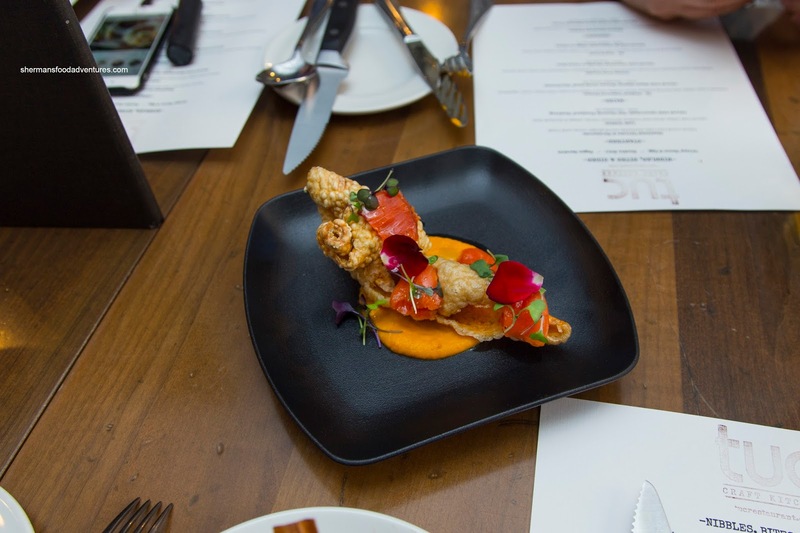 Moving onto the tasting, we began with the Steelhead Ceviche & Chicharron with citrus cured Lois Lake steelhead atop puffed pork rinds and carrot ginger puree. Exhibiting a balanced acidity and hits of lemon lime, the buttery steelhead's sweetness was able to come through. The smooth puree added more sweetness as well as a sharp spiciness. Aromatic and crispy, the chicharron exhibited an almost egg-like essence and aroma. From light over to meaty, we were presented with the Lamb Dukkah on top of white bean hummus and Moroccan relish finished off with sesame & chickpea dust. I found the lamb patty to be juicy and tender with an appealing bounce texture where the spices were apparent, in particular the cumin. The spicy and tart relish featuring jalapeno and mint was a nice compliment to the lamb while the firm spicy carrots were tasty on their own. Next up was the Seafood Tamarind Bisque featuring Salt Spring mussels, white prawn and snapper in a chili tamarind broth with Thai basil and local veggies. 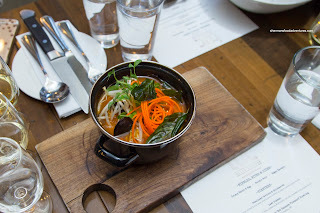 The bisque was rather brothy and tart with the aromatics from shrimp paste and brininess from the seafood. There was a background spiciness that didn't overwhelm the delicate seafood including the meaty shrimp, flaky fish and briny buttery mussels. Although wilted, the veggies retained their texture and crunch which was a nice textural contrast. Alternating between light and heavy, we went back to the decadent with the Crispy Pork Curado sporting a Gelderman Farms braised pork shank, roasted corn, charred tomatillo verde, celeriac slaw and local greens. This was a site to behold with a beautifully crispy pork shank where the fat underneath was buttery and gelatinous. Beyond that, the meat was tender, moist and also gelatinous. The sweetness of caramelized roasted corn broke up the heaviness while the slightly tart and mildly spicy tomatillo added brightness as well as the crunchy slaw. 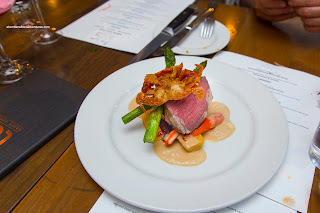 Since we were alternating back and forth between seafood and meat, it was fitting that our final dish featured both in the Surf & Turf. This was an interesting interpretation with miso-cured tri-tip steak, tempura soft shell crab, confit sweet potato and miso foam. Ever-so-lightly battered, the soft shell crab was crispy on the outside while still moist and soft on the inside. It was sweet and of course exhibited the classic crab essence. I thought the steak itself was tender bordering on chewy. With that being said, it was cooked nicely medium-rare and wasn't hard to eat. It was lightly salty from the miso, but not overly so. For dessert, we were served the Chilled Chocolate Fondue with fernet-infused chocolate Anglaise, marshmallow and honeycomb toffee. This was pretty sweet due to the combination of ingredients. 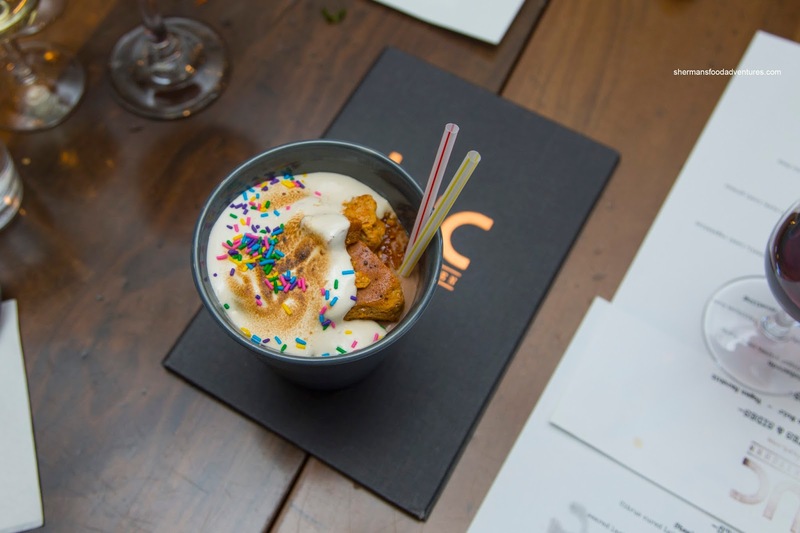 So if you have a sweet-tooth, this would definitely be up your alley. The whole thing was smooth and chocolatey while the honeycomb added a sweet caramelized smoky crunch. 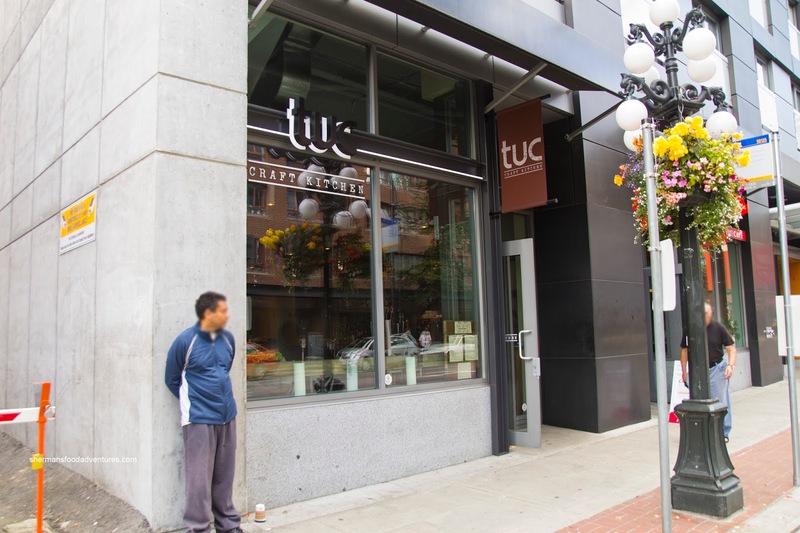 Like clockwork, the dishes from the Summer menu at Tuc were solid and executed properly. I've never had a bad meal here and this was no exception. - Not much to complain about. Only thing was the slightly chewy steak.